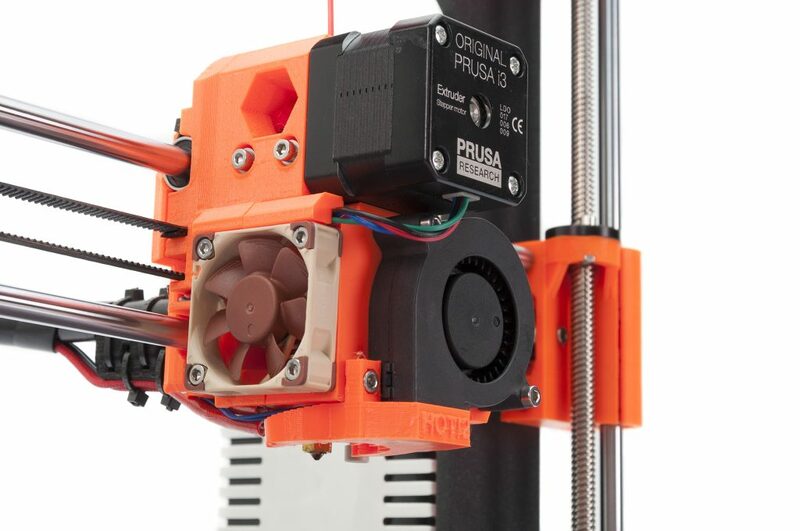 Original Prusa i3 MK3 is out! And it’s bloody smart! So let me introduce you to our newest addition to the Prusa Research machine lineup, the Original Prusa i3 MK3 (⊙.⊙(⊙ₒ☉)⊙.⊙) It looks very familiar, but basically all the parts are new and improved. Don’t be deceived by the familiar look! Let’s take a dive into all the crazy features we achieved. What I am the proudest about is the fact that MK3 is bloody smart! I repeatedly said that print quality for FDM is peaking, especially with our MK2 holding the top ranks everywhere for over a year, and now we just need to make the technology more digestible for casual users. To do this we added plethora of sensors which can help the printer either guide the user or prevent failed prints. Filament sensor is one of the technologies which will be and should be present on all new 3D printers. There are many ways how to detect a filament, for example, a mechanical switch or an optical switch, but we chose LASERS. Our optical filament encoder not only detects the presence of a filament, but also its movement. This means we can detect running out of the filament, pause the print and ask the user to insert a new spool. That is pretty basic. But we can also detect stuck filament and offer the user a cold pull to clean the nozzle and continue the print. We also have a second way to detect a jammed nozzle, but more on that later. Little added convenience is the filament auto loading. When the new filament is inserted, printer detects it, offers a preheat and then finally loads it into the hotend. Watch at YouTube New York Maker Fair’s improvised on-site demonstration of the Original Prusa i3 MK3’s new features – skipped layers detection, power failure and filament run out. Noctua nozzle cooling fan and print cooling fan. Both can detect RPM. A normal single-head printer usually comes with two thermistors. One in the extruder and one on the heatbed. We have two more increasing the total to 4 and both are there for a very good reason. One is measuring ambient temperature on the electronics. This helps us prevent non intended MINTEMP errors when starting a print in areas with 15°C or less (yes some people do that and previously had to use a hairdryer to warm the printer up). It also detects a board or connector failure! The second one is embedded in the P.I.N.D.A. 2 probe tip. 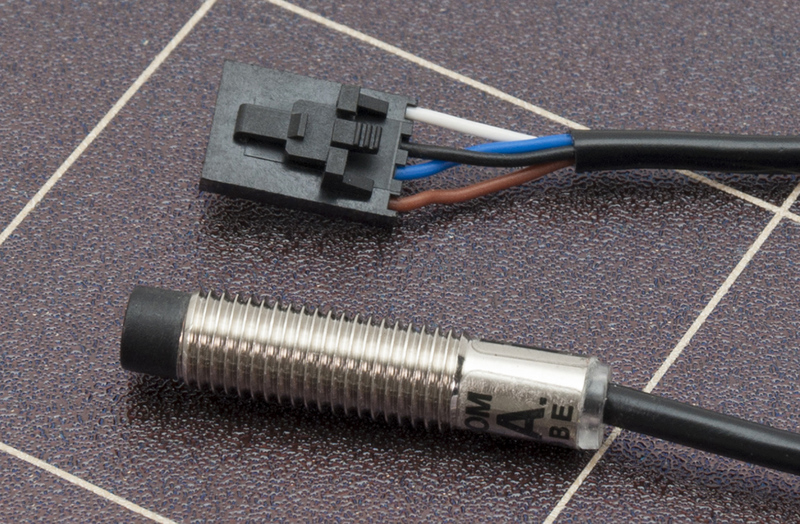 Normal induction sensors have a temperature drift, meaning that different temperatures might cause the probe to trigger at a different height. Now we can compensate for it, so you can leave the printer preheated for hours and the first layer will always be spot on! P.I.N.D.A. 2 sensor with additional wire for an embedded thermistor. 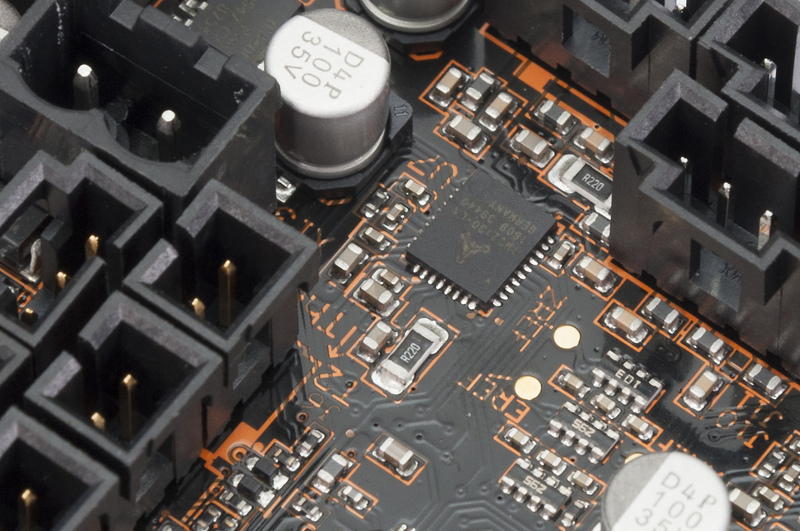 We co-developed the new EINSY (named after Einstein) RAMBo motherboard together with Ultimachine and I can tell you, it is the most advanced 3D printer board out there. It still has many tricks up its sleeve. A neat trick is the monitoring of power, this enables us to detect blown fuses, very important for debugging with our KIT builders. But that is just showing off, I have one more big thing. It features TRINAMIC drivers! Not in a way you know from silent StepStick drivers though. This time, it is the proper way with all the features enabled and accessible through SPI. We had to switch to 24V to get the right amount of juice from the motors and the heatbed, unfortunately greatly complicating printer upgrades. Trinamic2130 drivers with absurd 256 microstepping, when properly tuned (Trinamic itself is working with us), are extremely quiet. So quiet we had to upgrade to Noctua fan not to introduce more noise 😀 At least in silent mode. In normal mode, which is still quieter than 99% of the available printers, they can also detect lost steps. This has big implications, the printer can detect shifted layers, rehome and continue the print without a problem! In this mode, faster print speed is also possible at 200+mm/s. MK2S topped at around 100mm/s before, still pretty fast but slower… The Extruder motor can detect a jammed extruder as I hinted before. X and Y axes can home without endstop switches, removing few parts which can fail or be poorly mounted with KIT assembly. This is a quite extensive list of electronics upgrades. But we are only halfway through the post, we have hardware updates too. The most wanted feature was an improved frame rigidity. We are now introducing the reworked Y axis from aluminium extrusion. It provides the same rigidity as some other printers, while providing the sleek look of our milled Dural frame. The frame is also optimized to add 10mm of Z height totaling at 210mm. 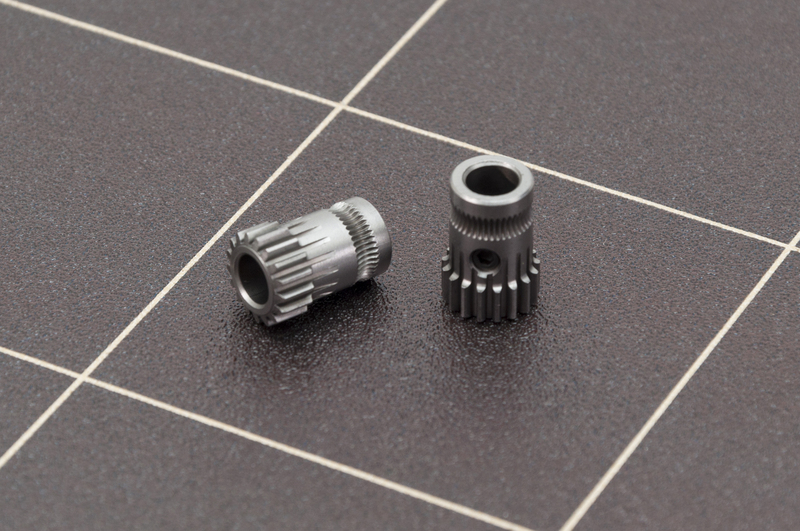 The extruder is now upgraded to a genuine Bondtech drive gear. We are using the same on our Multi Material upgrade and we fell in love so much, we had to include it here too. It grips the filament from both sides, increasing the push force of the filament and making it more reliable, especially for flexible filaments. When we are at the extruder, print cooling fan now cools part from two sides, increasing the overhang performance. With PEI directly on metal, we removed the weak spot of the 3M glue. When you crash the nozzle into it, metal can dissipate the heat and prevent the surface damage. Warping of materials like ABS also does not introduce bubbles like on the previous generation. New steel sheets are also incredibly easy to replace even between the prints. The surface of the sheet is slightly rougher, causing matte finish on the bottom of the printed parts. Since we used it on our farm (almost 300 printers nowadays), it received a universal praise. As the sheet cools down, parts pop off by themselves and little stubborn ones can be removed by taking it out and simply flexing the sheet. Being smart and easy to use is the main motto of the Mark3. The print quality of MK2 was setting new standards since the release and it is improved here too. MK3 will be a little more expensive at $749, it is a great deal with all the cutting edge features. MK2 will remain with a $100 lower price of $599. Let’s talk upgradability now. We have over 30 000 MK2s in the wild now. We’ve been offering upgrades to the latest version in the past. 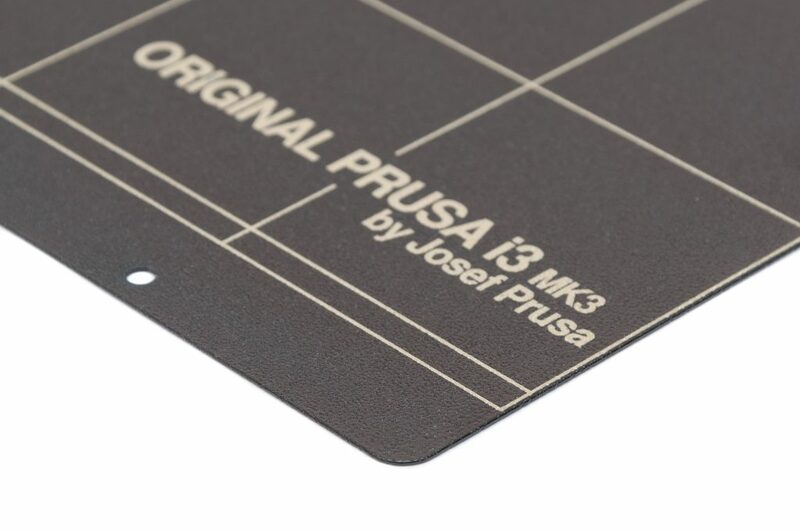 Everyone who bought our Prusa i3 2.85mm could upgrade to MK1, then to MK2 and then to MK2S. Do you know any other company that would care so much about their products? Unfortunately, a full upgrade is not possible (and we have really discussed this extensively) due to the new frame and switching to 24V. We tried really hard, but basically, all parts would end up replaced. UPDATE (10/19/2017): You have asked for it, and we have always listened. Even though almost all the components are needed to be replaced, it will be possible to upgrade from MK2/S to MK3. Unfortunately, the price is not very upgrade-friendly and you could practically build a second MK2 from the leftovers. But you have the option, and that’s important. 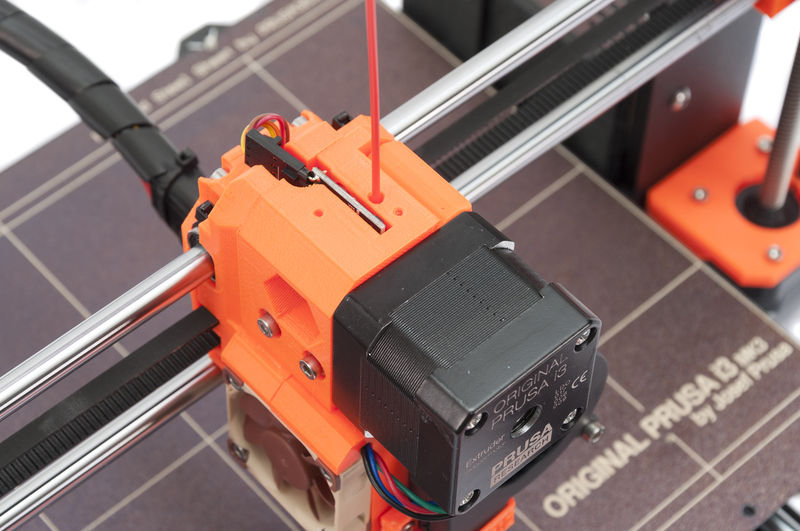 If you don’t need a full MK3 upgrade, we have the second best option for you – the MK2.5 upgrade. It gives you the best features of magnetic bed with spring steel sheet, whole new extruder head with Bondtech and Noctua fan goodness and also the P.I.N.D.A. 2 bed leveling sensor and filament sensor. The retail MK2 to MK2.5 upgrade price is $199. If MK2S was bought during the last 30 days before this release, it is just $99. If you bought MK2/S before, ever, it will be $149 for you. I know it’s a really great deal but the magnetic heatbed and the extruder improvements are extremely useful and we want to spread them rapidly. UPDATE (10/19/2017): We have sent all discount vouchers on October 18 2017. If you believe that you should receive voucher and you didn’t, please, check your spam folder before contacting our support. Multi Material will be available shortly after the MK3 starts shipping with a slight upgrade, by including filament sensors for all 4 extruders, increasing the reliability immensely. But the MK2 version will be supported too. 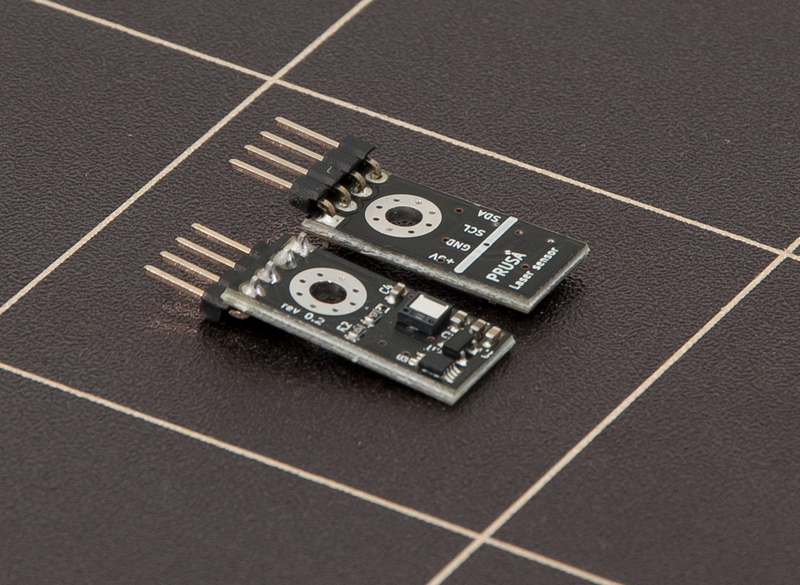 The filament sensors will also be available on the e-shop separately. P.S. New EINSY RAMBo board has a special accessory header for connecting Raspberry Pi Zero W. All fits inside standard motherboard case and power is provided to the board. Adding OctoPrint to your printer was never easier. We plan to provide special distribution to let you connect to wifi from the printer LCD interface. Original Prusa i3 MK3 kit available to preorder at our eshop for $745/with $50 UPS Expedited shipping to the USA or 769 EUR with VAT. Assembled MK3 is available for $999 or 999 EUR with VAT. UPDATE (10/19/2017): The full MK2/S to MK3 upgrade for $499 (VAT included), the partial MK2/S to MK2.5 upgrade for $199 (VAT included) and the Multi Material upgrade for MK3 for $349 (VAT included) are now also available for preorders. Guys, if someone goes to http://blog.prusaprinters.org/ , this post doesn’t appear. Cache problem? …also be sure to update http://www.prusa3d.com/ . I want one so bad! This new MK3 ROCKS! But then again i bought like a month ago, saved money for it, finally bought it, cause when i was a student i did the reprap version, the cheapest possible, you probably know… students. Things is, if i had known, i probably waited a month longer. its like buying saving up for a new phone, wanne buy the best phone, finally taking the step to make the ‘investment’ and have the newest gadget on the market and a week later you hear the new model is out. And you feel just stupid and a bit sad and unlucky. you wanted the best on the market from that company, but you did not, and it is not for everyone to buy mk3 immediately after. At least not in this part of my life. Just to be clear dont wanne make you feel sad or complain too much i am happy for you and the company and just excited in general about the improvements. But it makes me feel stupid and sad that i didnt see it coming cause i would have happily waited a month for the real deal… I just need to say it, that you know, i am probably not the only one. And it would be nice you just read it and took notice of it. Not asking for more. A touch disappointing. Three days after my mk2s kit arrived and this appears. I wish I had known. Same here! I bloody love the printer got mine about 10 days ago. Being saving up since January …. I was suppost to wait until October but couldnt anymore. Now I wish I did. Great upgrades Prusa!! I’m holding out for a larger volume printer. Do you think are Prusa going to make a bigger volume printer? I thought it was going to happened on MK3 upgrade. They have to compete with Creality CR10s in terms of build size. Realy, just got my mk2 kit yesterday. If i had known this i waited a bit longer. To bad it wasnt pre anoced. That’s the reason why it wasn’t, I ordered mine on the 25th July with a delivery date of end of September, then suddenly they bring that date forward and I took delivery on the 8th August. So no special price for me . I’m feeling massively let down. I just got my MK2S built (Came in this week), due to Power supply problems it’s not even working yet! I would definitely have bought the MK3 had I known. Guess I will have to go with the $99 option and get at least the MK2.5 upgrade. Can the MK3 accept the multi material upgrade? It looks like it’s a no for now. However, since it uses the upgraded extruder. One would hope less parts, and therefore less cost to upgrade to multi material in the future. Time will tell. -When can we expect the new Parts in your Git-Repo? -Will you sell the new RAMBo/ Heated Bed as a Standalone? Also, why did you stick to the ATMEGA? Wouldnt a 32-Bit platform make better use of the TMC2130-Drivers as you could bypass the interpolation? The interface uses SPI for TMC2130 (4 wires), while ATMEGA 5260 (I assume, can’t find any specs on utilmachine) has 8 bit, nothing stops them from sending commands back and forth in multiple segments to get the full resolution. I suppose it would make a difference if the printing speed or accuracy was somehow limited due to processing power or bit width of the ARM processor. If you want to rewrite the entire firmware from scratch for a new processor, and test it for years and years, I’m sure Prusa would consider using it. Will there be a MK2S MMU to MK2.5 MMU upgrade kit accounting for the differences in the extruder and the extruder drivers? Bump. Same question. My MMU is shipping in November and would like to know if I should cancel it until the upgrade is available. Hoped you will go for a 32bit controller board with the trinamic stepper drivers. Still a 8-bit 2560. For the rest nice job. This is a company that really seams to listen to their users. I have followed this company and watched with envy at the products that they come out with. I have always settled for second Best, but the Mk3 is definitely on my shopping list, maybe the multi filament version. I better start saving my pennies and also have to buy a bigger desk! Well done Josef a superb update. Hey, Is there any upgrade kit planned? 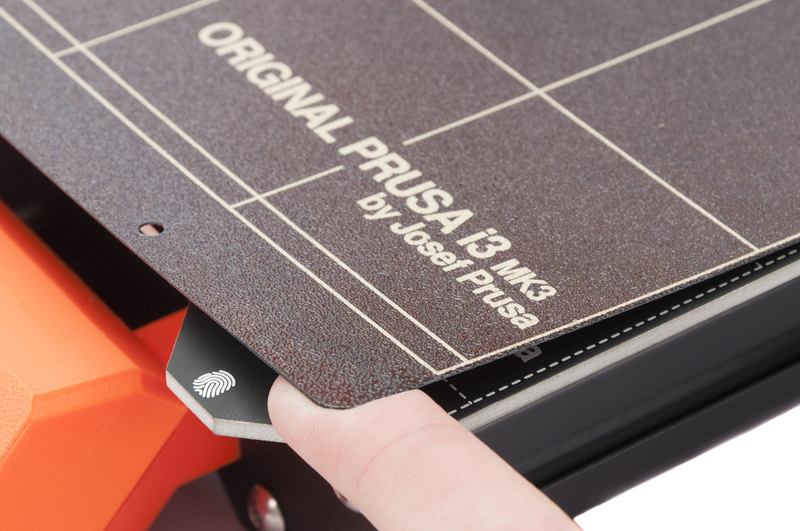 I’m very happy for Prusa to become a really innovative company! Congrats all designer + developer who contribute! I’m in the same boat. I just got my Mum upgrade in the mail yesterday. I hope they have an upgrade path for us with the MK2S with the MMU. Powder coated PEI steel sheet. Perfect! Would it be possible to buy some spare one? When printing finish, just change it and print all day and all of the night. Also. Will the multi-material upgrade still work on the mk3? Bwahh. I just missed the free shipping sale on the MK2s so I didn’t buy it and was waiting for free shipping again. Glad I didn’t. I will have to check the MK3 out after this weekend. The free shipping deal is what pushed me over the edge on the purchase. I thought I was getting a good deal. Now I see it’s the same as buying the (newly discounted) MK2S at retail, and paying shipping…which I never would have done. It was the same for me 🙁 I received my printer few days before this release. This was not right, Joseph! I understood you had few printers laying around, but this was not good for the customers. Now I am still waiting for the 2.5 upgrade and I still feel screwed. I know what you mean, waiting since April for mine and it was shipped out on the 20th and still in transit. Really, you guys couldn’t give us the option of upgrading to the new model, especially if we were waiting that long??? Just really poor judgement I have to say. What about Multi material upgrade? Maybe I missed something, but does the mk2.5 upgrade allows 200mm/s print speed ? I would love to get the MK3, but need to find a good way to dispose of my other 2 printers first. What is Prusa’s return policy? I have been trying to communicate via email for two weeks, and cannot get an answer how to get a refund. I bought a pre-assembled printer and it has never worked correctly since I received it in August. It is just collecting dust on my desk. 100$ discount for the 2.5 Kit hopefully at least applies for people which bought the printer over half a hear ago and just got delivered it in the last month? I guess abandoning the e3d hotend means 3mm filament is abandoned, too? Pre-order MK2S / Multimaterial Upgrade purchaser here. After a significant wait time, I received the the MK2S printer about a month ago. Multimaterial showed up last Thursday. After a month of printing on the MK2S, the issues solved by the MK3 become very obvious. The threaded rod frame was inadequate, causing tedious alignment issues, not mention the black oxide finish (although it looks good) has already started to show signs of oxidation. Alignment issues then leading to pinda probe failure. Pinda failure resulting in the nozzle crashing into the bed (hard, repeatedly, on multiple occasions). At the same time the pinda’s sensitivity causing the adjusted first layer height to vary between 0.50mm and 1.50mm. I spent a lot of time troubleshooting these, so I am aware I am not the only one with this experience. To me, what sold the printer was the auto bed leveling and alignment correction. Prusa using the well known issues to sell the next generation seems off to me. The new “fix” features should actually be free warranty out of good will, such as the new frame, and the new pinda system. It is frustrating to see the other new features come out so soon, but that’s just the nature of industry. The new print bed looks awesome. It is the nature of any product. The longer you wait, the more refined it can get. Especially products in new fields. The issues you mentioned have fixes not requiring them to ship you free stuff. If they didn’t? Then the clones wouldn’t exist. You can’t fault them for selling an improved version, and not upgrading everyone’s existing one for free. No company does that with one-time purchase products. Products that you pay monthly for will say ‘free upgrade’ but it’s not ‘free’, it is calculated into the continuing price/service. Shut your face and take my money! Wow, i just bought one a few weeks ago and box still unopened as i was away on holidays when the printer arrived, wonder if they will take it back and swap for new model??? Question: Is the current multi-material upgrade applicable for MK3 as well? Why didn’t you add a simple “out of material” switch for the 2.5 upgrade? going for this one, started to gather pieces for a DIY project……also the MK2S was an option on the list. seeing the features… the DIY will cost “expensive” time and parts. so thats a nice side project. 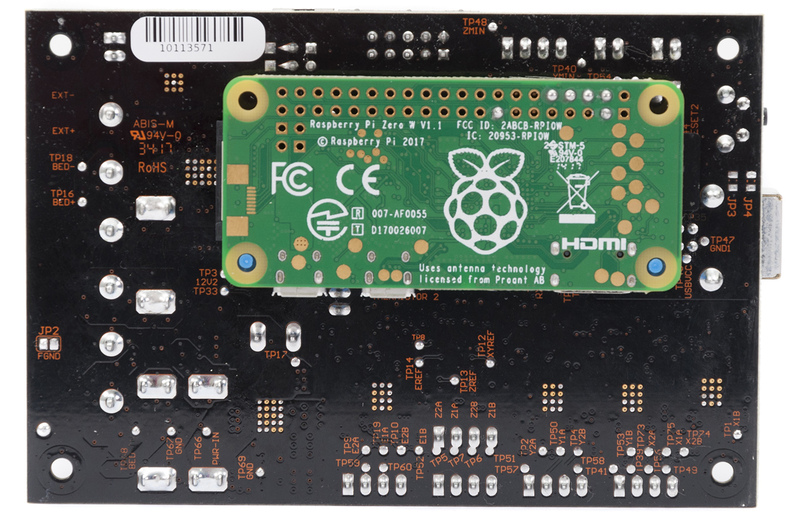 ordered the MK3 and hope it will be send in November…..
PS yes the 8-bit is used (not32bit) but it can connect the rasp-pi to it…. can it be used to expand the onboard processing power???? My MK2S arrived on the 22nd and I havn’t even opened the box yet.. So I was gutted to read this. I am tempted to use their 14 days returns policy and get a refund, and start all over again.. Problem is, I can’t get hold of anyone at Prusa (I guess they are busy following this announcement) and I don’t know how flexibile they will be if I cant get approval in time to get this back within 14 days.. I will end up paying 3x the shipping (the MK2S, the return and shipping for the MK3) but I guess its worth it. Very disappointed to hear about the new version, and having not received my MK2 yet, supposed to arrive today, I feel betrayed, absolutely no mention of a new version. I wanted the best and havent even received it yet only to find that it is outdated and not the best. In my opinion the 24V system is far better than the 12V, everything I read had no mention of the 12V system on the MK2S, I assumed the “best” already had a 24V system, and now to find out that is the portion that will not be supported in the upgrade. It would have cost me an additional $50 for the MK3, and now your offering me the upgrade for $99, which doesn’t include the 24V system, seems to me like I just lost $781, my goal was not achieved. There is more than just a great product to be a world class company, and not informing new customers about new versions, in my opinion shows absolutely NO customer loyalty. I really feel betrayed. It is going to take a lot to turn me into a happy, loyal customer. Why not send me the MK3 and I will turn the MK2S into a farm printer for you. Haven’t even seen the first print and am already disappointed. Congratulations on the new release, it sounds fantastic. Thumbs down on making me feel like a valued customer, anything but. I ordered my Mk2 just recently and haven’t even received it yet. I was a bit worried about a new model coming out soon but I figured that there would be the possibility to purchase an upgrade kit like with previous models. Seems like a full upgrade will never be possible which is a bit of a bummer and make me regret not waiting a bit more. But I’ve decided to live with it. The price drop feels like a burn however. I hope Prusa will allow for a grace period and refund the difference in price. Otherwise I will send it back and re-order again, which only means more effort for both parts. It’s a good printer, but with such a big price drop before I even got it, and not being able to upgrade it beyond the MK2.5 (which costs me extra), I feel a bit cheated. How about a store voucher for those €100 it’s cheaper now? And with that I don’t really mean the €100 discount on the upgrade – if I knew, I’d have gotten the MK3 to start with. Ordered mine today! Thanks to life in general and Irma in particular I still haven’t had time to finish my MKS2 kit yet. Thanks Mr. Prusa. Can’t wait until it gets here. Hi Neal, the MK3 kit should come with 1 kg of PLA like the MK2S kit. I have a Prusa i3 (two years old). I shorted a board and burned a chip on the top board. I ordered another board and installed it and it sill will not work, and the LED will not even come one. I do not have a facebook account and I do not want one. for technical support, I suggest writing an email to info@prusa3d.com. I’m also pretty disappointed that I paid FULL price for the MK2S, and two days before I even got it, it’s already obsolete. Now I have to pay another €99 to get a not-quite-MK3, ontop of the full €999 I already paid (and then it’s basically a DIY kit again, with fewer warranties). It’s a good printer, yes, but I have a prusa-copy printer, which is doing pretty OK. Yes, the original Prusa i3 is easier to use, but I already have all the settings dialed into the copy, it’s printing fine now. So, I would have waited that extra month if I knew the MK2S was already obsolete. I really hope you have a better deal than me paying full price for the MK2S, and paying even more to get the MK2.5. I recall that when shopping over the internet, consumers can return products within 14 days upon receiving it. I’m seriously contemplating wrapping it back up, and sending it back. I’d rather pay shipping thrice and get a MK3, than paying another €99 to get a MK2.5. Any deals you can make to those that paid full price and found out about the release before just as they did their first print? send it back..thats what I did with mine. It took may conversations with customer service but they took it back, paid for return shipping, and now i just have to pay 50$ for the new printer. I never opened mine once it was I received it. I dont know if that makes a difference but its worth a try. Hi, I can not stop commenting, statements of those who have recently bought a previous model. When you buy a new car and after 2 weeks a newer model comes out so you complain too? Thanks to people like Joseph and his team, the open source world is expanding. Will there be upgrade straight from Mk2 -> Mk2.5? Ordered a mk2s in July with multi material, I am still waiting not shipped yet. 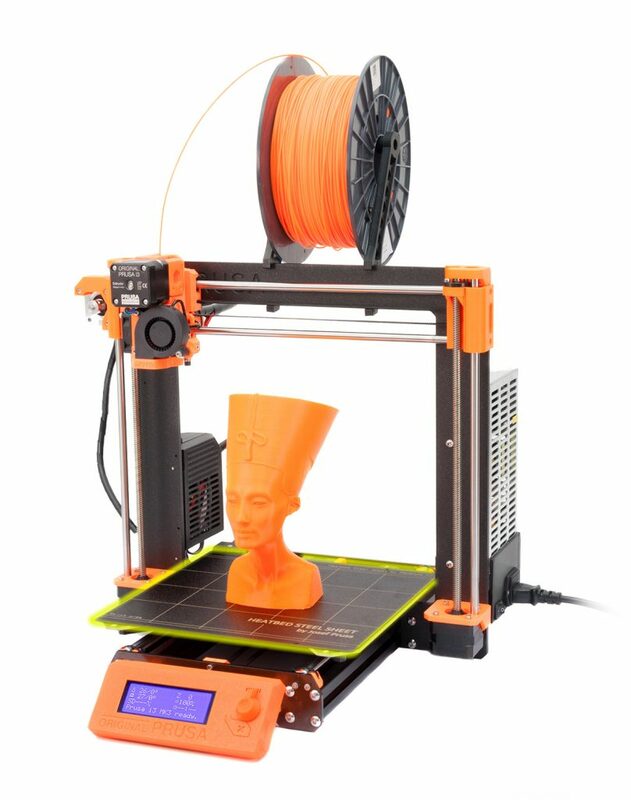 Contacted Prusa to see if I could pay extra to upgrade to the mk3, online helps said go read article. so basically no you can only upgrade to 2.5. and that is after waiting for 3 months. Put my order in 24Sep2017. Hopefully they got all the kinks worked out when it ships. This will be my first 3D printer and an getting it for the , cough cough, kids. Well this is not a good start I ordered the Original Prusa i3 MK2S on Friday then it gets price reduction yesterday due to MK3 launch. I want to cancel order and reorder at the lower price. Glad Prusa are bringing out a new model but they need to look after their customers and do the right thing. I have yet to hear back from Customer services I emailed them yesterday. When are we going t have access to the source project of the filament sensor, or at least to buy it and the control board stand alone fo those who want to upgrade their printers? Josef, congrats to you and your team! I’ve already ordered one. Can’t wait to get it and try it out. I’ll purchase the multi material upgrade as soon as it becomes available. I guess I’d feel better about my 16 day old MK2S if you guys could assure me that you’re not leaving your massive MK2S and MK2.5 base abandoned on the side of the road? Can we at least hope there could be future upgrades after MK2.5? I’m torn between my original customer service “Chat” recommendation to buy the MK2S first (building it) and the 4 color upgrade I was planning next – or – dump my MK2S onto the “used” market at a significant loss, cancel my planned 4 color upgrade, resist the $99 MK2.5 upgrade (thanks, btw), buy the new MK3 and deny this ever happened to me. FML – This all began when I started looking at entry level printers under $200 about a month ago. Is there a link for STLs for the new Extruder? There won’t be Links to the STL files for the 2.5 Upgrade or the Mk3 until they ship the first Printer. They don’t want people cloning the printer before they’ve even shipped any, and I’m sure they are still doing minor tweaks to certain parts. PLEASE, PLEASE, PLEASE MAKE A LARGE FORMAT PRINTER 500MMX500X500. 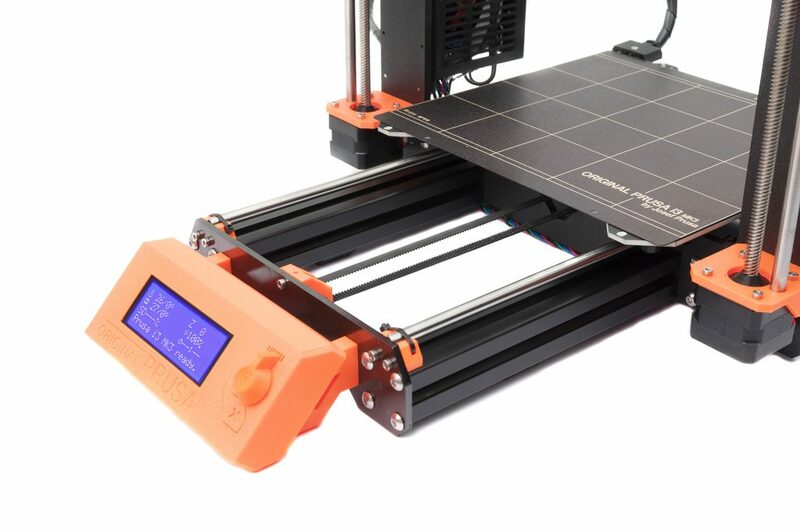 I have mk2 and ordered mk3, I would really love to see a Prusa large format printer. It’s a shame that you are moderating comments, instead of responding to them. You got quite a backlash from people who bought the MK2 just now. These have to pay extra, just to get half of the printer they would have gotten if they ordered a few days later. Please reconsider moderating responses (to “drown out the complaints”) and reply to your customers! If you’re trying to sit this out, I think I will return the printer. The EU allows returning items within 14 days to protect us customers (and I just got the printer that’s already obsolete). Since it was already assembled, and only used for 40 minutes, I rather buy the MK3 from that + what you’ll deduct from my refunds. Like I said, please unmoderate the comments, and reply to your customers. A lot can be talked out, but if you’re not trying to talk, then that’s the only sane choice for obsoleting a product within 1 day of getting it. Oh well I got one Prusa Mk2S for sale. who want to buy it? Got it in June. I don’t see where the print area for this new model is described at. Is the print area the same as the MK2S? I am slightly disgusted that the development of a newer model with no full upgrade path had not been more transparent. I received my M2KS kit about a week ago and it somewhat feels already obsolete even though I have not started building it yet… If there had been a little more transparency that the free shipping offer was to clear out inventory before releasing a new non-incrementally upgradable model, I would actually have waited to buy the MK3 kit. And even buying the update feels weird, I would retire perfectly functional new hardware before it ever was used! I initially chose to buy a kit from you guys because I felt confident there could be incremental upgrades in the future and the large up-front cost of the initial kit could be amortized over multiple incremental generations. I was hoping I would not have to buy an entire new printer every 2-3 years to benefit from the latest developments. Now I am wondering when support and incremental updates for the MK2S will be dropped. That by no means changes the specs or the quality of the kit I have but it does change my perception and expectations about the company. An explicit roadmap and public commitment on supporting the current models in the future would help tremendously in building trust. I’m still hoping they give like a 2.75 upgrade. Basically the 2.5 Upgrade but include the new Controller and a 24V powersupply plus two of these (https://www.amazon.com/dp/B01HEQVQAK/_encoding=UTF8?coliid=I30AY6SZNIYWL5&colid=BDEKTLJ9X6XP). This way we can wire the extruder and the Heated bed (which will be 12V) to those extra boards which would not only protect the Controller board since only signal would be sent from the new board to these board but allow us to use the 12V powersupply we already have to power those items, and then still be able to run the steppers and and all the new controls from the updated control board. I’m not worried about the Y-Axis frame as I can always upgrade this later with Opens Builds Extrusion. Does it still use the E3D V6 hot end? Really looking forward to upgrading my Mk2S. How does the spring steel build plate perform with PETG? Would it be possible to tailor the coating to create, say, a PETG-specific plate with lower adhesion? I just ordered my mk3 a few days ago! Can’t Wait! How’s production going? Did I order early enough to get mine before Christmas? I have already preordered one and I am excited! Any idea if and when will the multi material upgrade be available for MK3? Multi Material for MK3 is expected to start shipping from January 2018. Can I drive more than one extruder at the time with the electronics? I want to do material/color mixing. any new on vouchers? have MK3 and Rubby in my cart ready to order. Okay, that with the MK2/S to MK3 update was a good move. Now everyone can decide whether they want the full MK3, especially if they just bought the MK2S, and have enough parts to basically make another MK2 (with a few replacement parts I assume). The only thing I can hope now is that you will keep supporting the 12V line, and the MK2/S line, while moving forward with your MK3. Looks like the improvements are more for user friendliness rather then actual print quality. The only improvement I can see really worth it for me is the new Pinda probe. I have issues with the current probe and first layer height. I have not had many problems otherwise from my Mk2. The new bed I am not sure if it is a big deal. Will have to see what the durability is. I can buy spare PEI sheets locally rather then have to get them from PRUSA which is halfway around the world away. Problem I have found with Prusa is while their spare part prices are very reasonable, freight isn’t. This is not Prusa’s fault, they have no control over freight prices but from my experience with my Mk2, I would order some spares to go with the Mk3. Generally the propriety parts like the Pinda probe, maybe a spare bed sheet. I never had an issue with the linear bearings, but I did oil mine before installing them, I think that made a difference. I am still very happy with my Mk2. What will be the import fees for prusa i3 to india? I think you need to contact your local Customs Administration and ask them as every country has different rules.